Update: If you have OSX Lion, use this installer. Works well for me. If you've been following the controversy on DropBox not encrypting files in the manner they claimed, then you might like to encrypt your files on DropBox yourself. To do this, whats needed is a way to place files into the DropBox folder already encrypted, but access the files unencrypted. Here's how. The files you store in this manner will be encrypted and only on a session by session basis will you access them unencrypted. This means that if you lose your password, you lose you data. Simple as. The unencrypted presentation you get with this Howto is only a presentation: your files are shown decrypted, as soon as you log out, shutdown, the unencrypted presentation dies. run the command "encfs ~/Dropbox/encfs ~/Documents/encfs"
This creates a folder in your Dropbox folder called "encfs" (this is where the encrypted documents will be stored) and a symbolic link in your Documents folder, into which you put the documents you want to be encrypted on DropBox. p is a good option unless you really know what you're doing. Some more message and you're good to go. You'll notice that you get a new drive on your desktop - this is the decrypted portion. Doubleclick to open, and also the encrypted folder in your DropBox folder, and you'll see whats happening. To use, drag your files into this UNENCRYPTED folder / drive! 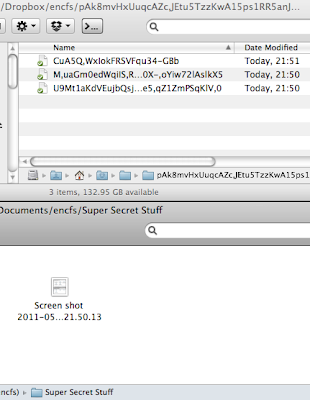 They will be magically copied, encrypted into the 'enfs' folder in your DropBox folder. One thing I noticed is that files take a bit longer to sync, even comparing to unencrypted files that aren't already in DropBox somewhere. The mounting of the unencrypted folder doesn't happen automatically when you login, so run this command again. CAVEAT: If you have any programs that auto-start and expect their data to be in the unencrypted folder, make sure this command is run first, else corruption and data loss may results. Before the command is run, there is no plain text data available, because encFS and MacFUSE are decrypting the copy thats in your DropBox. If you lose the password, you lose your data. The folder created in your Documents folder will be empty. If you delete this folder, next time you run the command you'll be prompted to create it. You can repeat this process on any computer that is linked to your DropBox account, and you'll be prompted to (re)create this folder.